what is the best diamond colour? Diamond colour is a grading system that determines the level of colour present in a diamond. In fact, colour grade determines the absence of colour in a diamond. White diamonds are graded from D (colourless) to Z (light yellow), a classification scale created by the Gemological Institute of America. As you go from A – Z, the diamond will go from having an icy, colourless appearance to exhibiting a brown or yellow tint. With standardised grading, diamond buyers can make more informed purchases. At Taylor & Hart, we only use GIA-graded centre diamonds in our designs. Each diamond comes with an accompanying certificate stating its colour, clarity, carat as well as a cut grade for round diamonds. Grades D – F are colourless and icy white. These are the rarest colour grades and therefore, carry the highest price. Grade G – J are nearly colourless, with distinctions so subtle most are indistinguishable to the untrained eye. Diamonds in the near colourless scale won’t exhibit a noticeable tint in most cases. The colour grade system goes all the way to Z, however we recommend, and only sell, a colour grade J and above. What diamond colour grade is the best? When it comes to diamond colour grading, a colourless diamond is incredibly rare and carries a premium because of this. The higher the colour grade, the less colour there is present in the diamond. The lower the grade, the diamond will likely exhibit a very slight yellow or brown tint. Similarly to most diamond characteristics, choosing your diamond colour really does depend on your personal preference. If having the highest diamond quality is important to you, we’d recommend choosing a colour D, E or F diamond that is in the colourless. These diamonds are incredibly rare, which is reflected in the premium price point of diamonds in the colourless category. 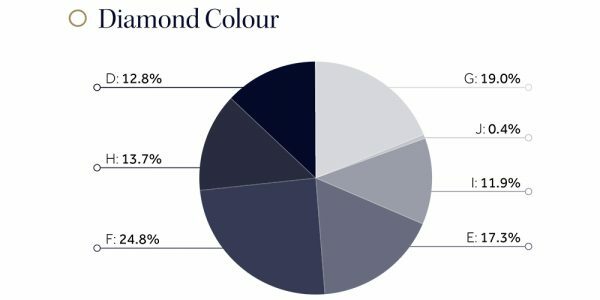 If you’d prefer to spread your budget and balance the 4 Cs of diamond quality across other elements, it would mean you could select a colour grade G-J. The colour difference between these grades and the colourless category is minor and not visible to the untrained eye. This would allow you to choose a diamond with a greater clarity grade or carat weight, striking a great balance between value and overall aesthetic. If your diamond is going to be set in 18 carat yellow or rose gold, you can choose a diamond with a slightly lower colour grade. The warmer colour tones present in the metal will accentuate the bright white appearance of the diamond. For the best overall value, a G-H diamond from the near colourless category is a great choice. The visible difference between these grades and grades in the colourless category is minor, but you could make huge savings. What diamond colour is the most popular? The most frequent diamond colour we see amongst our customers is F. This is closely followed by E and G.
E and F colours are in the colourless category while G is in the near colourless category – all diamonds in the colourless and near colourless category will appear bright and white in appearance. How does fluorescence impact diamond colour? Another aspect of diamond colour is fluorescence, a blue glow that appears when you expose a diamond to UV light. According to the GIA, fewer than 0.2% of diamonds with extremely strong fluorescence may appear hazy or oily in natural daylight. When choosing a diamond, consider fluorescence last.